The Australian Labour-proposed emissions trading scheme is insane. Basically government places a huge tax on an industry (let's call it $1,000,000). It then gives up to $300,000 back to said industry as an incentive not to move to a country where it won't be taxed $1,000,000. It gives up to $300,000 to researchers trying to find better ways of not producing carbon emissions. And it gives the rest to struggling households who have been charged far more by the industry trying to survive after losing $1,000,000 of it's previous profit to the government. Do you think the industry is going to stay? I don't. Do you think that the middle and upper income earners will be 'reimbursed' for extra household costs when the low income group is swelling in its ranks as job losses snowball? I don't. And what will the spin-off for New Zealand be, given Australia is our biggest export market? If the government-directed breakdown of free-market price signals sounds like creeping socialism, it is....the ultimate cost in terms of jobs and growth is unknowable. 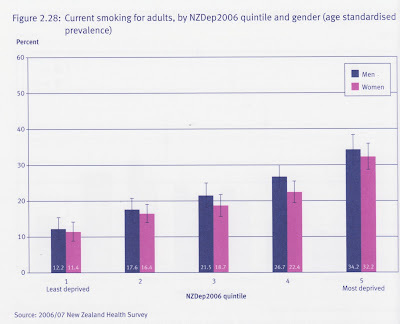 Check out the graphs below and understand why many New Zealanders get very frustrated about people being described as living 'in deprivation' in this country. 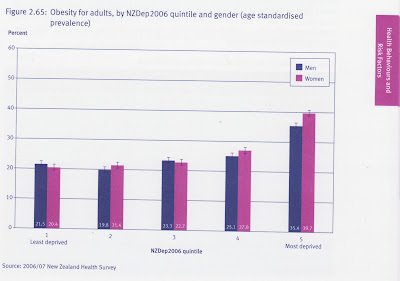 People living in the most deprived areas are the heaviest smokers, drinkers and eaters. 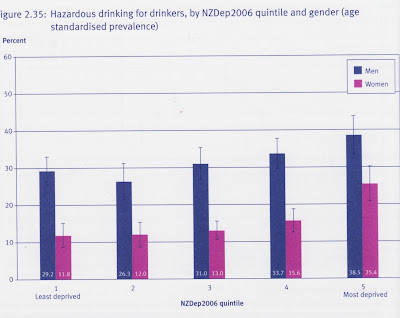 The just-published New Zealand Health Survey proves it. Another fine example of how leftists have inverted the meaning of words. Rodney Hide talks about ACC with Justin du Fresne on NewstalkZB (starts at 33.33). Rodney makes the point (more than once) that it is the way ACC is funded that lays it open to abuse. "The incentives are all wrong. We have produced a nation of cheats and crooks." He says change the system. The principles are wrong. Contributions should be made in our name, into a personalised account, then when we claim, we run down our own money. We can only rip ourselves off. That is what should have been done at the outset of ACC. 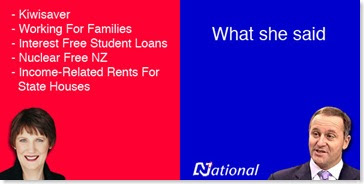 This prompted a call from someone asking why it is National is such a useless opposition and it is left to the likes of Rodney Hide or Ron Mark to say what the majority of us are thinking. And no. It wasn't me. Given it is National's policy to "intelligently intervene" in the economic and social lives of New Zealanders, I wonder what they will do about child support? National MP Judith Collins, a long-time critic of the Government's failure to target payment dodgers, was unimpressed. "This is a government that is happy to nab at the border, people with outstanding parking fines and speeding tickets, but turns a blind eye to the billion-dollar-plus problem of burgeoning child support debt. That's appalling." More cracking down? More surveillance? More prosecutions? The problem with the child support system is that it is inherently unfair and biased towards the custodial parent, usually the mother. What is financially required (and taken from the non-custodial parent) is not based on the costs of raising the child but on what the non-custodial parent earns. But the child support system is only a spin-off from the DPB system. If there was no DPB, which acts as an incentive to become a single parent, there would be nowhere near the current number of liable parents - 157,858. As I have argued many times, the state can't have it both ways. Not morally anyway. It can't replace the father and then expect him to pay the bills. Hence the growing mess this area has become. Yes. As a general rule fathers should support their children. But they need to know that the child is biologically theirs (not currently possible if the mother resists) and the state has to stop putting up cash rewards to the prospective single mother. Yes. It used to be difficult for mothers to chase support through the court system and fathers ran the risk of jail for non-support. But these are different times. Avoiding becoming pregnant and giving birth is straight forward. And in respect of relationship breakdowns women are much, much better equipped to handle being a breadwinner and men are much, much better equipped for sharing parenting. Ultimately people have to work out their own problems. That's life. It's part of the process. If we won't accept that then we will continue on down this all-too-familiar road on which the state tries to sort every personal problem and leaves far bigger ones behind in its wake. Every week in Palmerston North, more than 200 children cower in their rooms knowing the grown-ups in the house are fighting. It's stated as fact. So how is this known? Child advocate Rachel Smithers says police attend more than 70,000 family violence incidents throughout New Zealand each year, while more than an estimated four times as many go unreported. Based on the figure of 400,000 incidents a year in New Zealand, there are 175 to 200 incidents in Palmerston North alone each week. How did she arrive at 400,000? Never mind. Palmerston North has 1.9 percent of New Zealand's population. So using the figure of 400,000 they have 7,600 family violence incidents. That's 146 per week. But it's still an estimation. If the reported figure was used - 70,000 - we would be down to 26 incidents. In two out of three cases, the adults think the children don't know and aren't affected. One Australian study has shown that only one in three abused parents realise their children know what's going on, when in fact, they all do, and they all want it to stop. Ignoring what this sentence actually says (which is nonsensical) and what the journalist intended it to say, it is not OK to extrapolate the findings in one setting as fact in another. And the following isn't the journalist's problem but highlights the silliness of some of these 'counsellors'. Ms Smithers says while many agencies offer help to abused victims, and to the abusers, her role is making people think about how the children are affected. There were almost always children affected when adults were violent, she says, even in cases like the alleged Tony Veitch incident. "There will be children who really admire him, and now they are hearing that he hurt a woman." So now even more of Palmie's children are victims of violence. Fallen role models. What a tragedy. Now, to be fair, there is every chance that many children in Palmerston North are frightened by parents/caregivers who are violent. Probably more than the police have had dealings with. Victimisation surveys show that violence in the home is amongst the least reported crimes. By all means say so and make your own estimations but don't write them up as statements of fact. The National Party's Arts, Culture and Heritage policy, announced today, confirms that National will maintain current levels of arts funding, should it be in the position to form a government following the 2008 election. But wait! There's a difference! National's approach is for intelligent intervention rather than constant interference. That has got to be THE catch phrase of the campaign. Apply it to any sphere of government spending. That is what National voters are going to vote for. You thought Labour was arrogant. Hah. The next generation we-know-best government is on its way. I've just enjoyed a really good belly laugh. ACT Party leader Rodney Hide says his bright yellow jacket is stylish and he will continue to wear it throughout the election campaign despite it being lambasted as a fashion disaster. The Newmarket Business Association has asked Mr Hide not to wear the canary-coloured garment which bears the ACT Party logo. Spokesman Cameron Brewer says it is an "intolerable sight" and does not help promote Newmarket as New Zealand's fashion capital. "For sure we see the occasional fashion faux pas around the place, but this is completely unacceptable from someone in a leadership role. To be getting around in a crass canary campaign coat is simply offensive to Newmarket, particularly during school holidays." Mr Hide says it is not the first time someone has told him to put the jacket back in the closet. He says Helen Clark has also tried to shut him down because the jacket has not been authorised under the Electoral Finance Act. Cameron Brewer really said that? "Offensive .... particularly during the school holidays"!!! I didn't think there was anything left is this country that could be offensive. Certainly not a politician whose ditched his me-too suit for something a little more colourful and fun. "What kind of message does this send out to our young people? It implies that when you're in position of power you can wear whatever you want no matter how inappropriate or horrid a garment may be. It's not right and so we're taking a stand," says Cameron Brewer. Good God Cameron. Get a grip. This is the Liberal Party. Nothing demonstrates better how illiberal too many people have become when a man can't step out in whatever the hell colour he likes and not get flogged for it. You got to love Rodney's chutzpah. How quickly complacency and abandon with taxpayer's money set in. This isn't big biccies but the percentage increase is. Please note that as part of business-as-usual activities the Families Commission holds annual staff planning days. The total cost for each planning day including venue hire, food, travel, accommodation, facilities and miscellaneous costs is $2,363 in 2005; $8422 in 2006 and $14,194 in 2007. The Families Commission now has 40 full-time staff. It is primarily a research unit on top of the massive research unit of the Ministry of Social Development. Yesterday I put up the stats showing the effect of rampant government. One reason - rampant research. Knowledge, knowledge everywhere and not a drop of use. Could it be privatised? Not a chance. Nobody would willingly pay for what they produce. Get rid of it.